If you’ve been a long time subscriber to our popular “Worm Farming Secrets” newsletter, you might remember Bentley Christie as our former lead newsletter researcher & author. Bentley was also a co-author to our best selling guide – “The Business & Biology of Raising Composting Worms” – which has literally sold thousands of copies since it’s first release. What most people don’t know is that Bentley also runs a “real-world” worm composting business located in Ontario, Canada AND a global worm composting education business operated from redwormcomposting.com. He has taught thousands of budding worm composters the fine art of composting with worms & is one of the most knowledgeable, friendly guys you’re going to meet. Jay Myer of Soil Secret Inc. has been is business nine years and has 4-5 million employees (the worms) and three human employees. Jay averages 1000-1200 lb. of Soil Secret Earthworm Castings production a week. Having started out just selling Soil Secret Earthworm Castings locally, Jay is now selling through sixty some garden centers and two distributors. In addition to the castings side of the business Jay does presentations to garden clubs, or to sales staff to help inform them of the benefits of Soil Secret Earthworm Castings. If your interest is in vermicompost / worm castings, Jay certainly knows his stuff. Michael’s story is an interesting one as his primary business is The Strawberry Store, LLC. which he began after collecting varieties of gourmet strawberries over the past 20 years. Shortly after starting this business Mike become interested in vermicomposting and believes it has totally changed how he grows the seedlings and plants in his nursery. During 2009 he also started VermiTec, an online mail order vermicomposting supply business. Mikes’ operation now processes in excess of 80 lb of waste per week. In 2009 a total of 500 gallons of vermicompost were harvested and stored for use throughout the year. Due to fantastic business growth, he is planning to increase vermicompost production by 200% in 2010. If you want to learn more about the worm tea side of things that have been applied in a real world agriculture business Mike is the man. Holding a major in Ecology and being a high school horticulture teacher, Angela’s passion for worm farming started about four years ago when she moved to a very environmentally friendly community called Raglan in the North Island of New Zealand. Shortly after building her first of 4 worm farms for her school Angela became amazed with the amount of food the worms could process. She then tried selling some of the worms, and within hours she had her first success and sale. That is where it all began and Angela has since progressed to selling different types of worm farms, and worm tea (leachate) in various volumes. Angela says her main motivation for this business is mostly helping New Zealand be more environmentally friendly. Jerry Gach has been raising worms for the past 7 years and his interest in worm composting began through a need to feed 50 hungry box turtles. After attending a local composting seminar that filled two classrooms of people interested in Worm Composting, Jerry soon realized there was a serious business opportunity in worms. What started as a plan to raise African Nightcrawlers, evolved into a high volume worm business selling every type of commercial worm available. Jerry now manufacturers his own commercial flow through composting system, The Worm Inn, which is currently being used by the two major Vermiculture Research Facilities in the world (Ohio State University and North Carolina University), and will soon be sold via a licensing agreement in Europe. What type of worm composting system would you recommend for a beginner that was looking to go to that next level and why? How much should someone be prepared to invest in their hobby in the beginning to move to a thriving business? Is there a key amount that will make or break the opportunity? In what tools, equipment, training etc would that money be best invested? How are you making your money (i.e. what are you selling – please discuss ALL products / services you offer related to the business) and which area is most profitable for you? How do you find customers for your products / services? If you had to start over again, but you were only able to use ONE form of marketing / advertising to generate customers, what would that be? What would you consider to be the single most important investment you ever made for your worm business? Assume you’re having a conversation with a person that has a basic worm composting system (i.e. can-o-worms etc) but would like to go to that next level and make a few hundred extra dollars each month from their hobby. What would be the first logical step for them to take? What would be the second and third? How do you harvest your worm castings? Do you use any form of equipment? Can you recommend a low cost but efficient solution for people just starting out? What about a solution for separating worms from castings on a large scale? What is the best way to package worm castings? How much should one include in a single "package", what type of packaging should be used and what do you do about labeling? Is it better to pack worm castings wet or dried or doesn't it matter? How do you determine worm cast pricing? What is the best place to focus on selling worms castings? The local market, local greenhouse, other etc? In your opinion, if someone wanted to really focus on worm castings as their primary product, what would be the best overall worm composting system / setup to use to maximize production? Our third area of focus was related to the subject of actual composting worms themselves as the product & includes detailed and thorough answers to questions such as..
How do you separate your worms from their bedding? Do you use any form of equipment? If you do, how do you deal with sending live worms in the mail or over long distances? Do you think it’s best to sell worms based on individual worm count, by total worm weight, or by worm weight including the bedding? How do you determine worm pricing? Would you recommend someone focus on selling one type of composting worm or several and why? In your opinion what would be the best type to begin with? The biggest selling factor for live worms seems to be "large fat worms". Do you have any specific food formula you use to condition your worms for sale? Do you have any techniques to increase worm reproduction and maximize stock numbers? Can you discuss the specific process you use for making worm tea in detail and provide suggestions for someone looking to get started? How do you store and package (and source packaging for) your worm tea for sale? Do you have any techniques to improve shelf life? Do you have your worm tea tested to determine nutritional composition to include on labeling to help improve sales? If so how do you test it? If not do you think this is a good idea? How do you determine worm tea pricing? What is the best place to focus on selling worm tea? If someone wanted to really focus on producing and selling worm tea as their primary product, what would be the best advice you could give them? What a fantastic bunch of information! Much of it is above my level for sure, but it will be something to look forward to in the future. What a diverse business, it should never get boring no matter which specialty you go into. I only started last year with 2 pounds of European and 1 pound of red wigglers. I put them in four separate 4 gallon plastic buckets. I now have 100 buckets of mixed worms. As you can see, I've left no stone unturned when it came to really getting down to the nitty gritty of how these guys (and gals) actually operate. …"The Worm Composting Professionals Interview Collection" has been produced in digital (PDF) format, so it’s available for you to download to your computer and read right now, even if it’s 2 am in the morning. You will be able to download the book immediately after payment has been made. 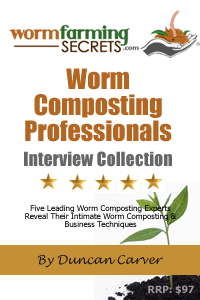 When you download the “Worm Composting Professionals Interview Collection” today, I’m also going to hook you up with one of the largest wholesale distributors of composting worms (and related products) in the USA & Canada! Order at wholesale prices – place your markup on the products – and take them down to your local garden market to turn a profit. That’s right. This is the very same distributor we use personally to sell thousands of dollars worth of live composting worms & related products every single month from the website you’re on right now. You’ll be able to purchase at wholesale rates to use as base stock to grow & expand your own worm composting systems – or simply place your markup on the worms and on-sell them directly to your friends, family, workmates, associates, or setup a stall down at your local market garden (i.e. read the advice in the collection – hint, hint).